Smoking causes lung damage, increased heart rate and high blood pressure. It also narrows the blood vessels. In a person with diabetes, these effects are increased. The risk of heart attack, stroke and other blood vessel problems are much greater. Many smokers end up with amputations. 20 minutes: Blood pressure, heart rate and the temperature of hands and feet become normal. 8 hours: Oxygen and carbon dioxide levels in the blood become normal. 1 day: The risk of heart attack begins to decrease. 2 days: Sense of smell and taste improve. Nerve endings start to regrow. Mucus in the airways begins to break up. It also clears out of the lungs. 2 weeks-3 months: Circulation and breathing improve. It becomes easier to walk. 1-9 months: You will see less coughing, sinus congestion and shortness of breath. Fatigue decreases and energy increases. 1 year: Happy Birthday! Risk of heart disease is now less than half of what it was one year ago! 5 years: Risk of cancer of the lung, mouth, throat and esophagus, is half that of a "pack-a-day" smoker. 10 years: Risk of dying of lung cancer is now similar to nonsmokers. Pre-cancerous cells have been replaced. 15 years: There is no more risk of heart disease than if you had never smoked. Important steps to take Make up your mind to quit. Ask your doctor, family and friends for help. Several medicines are available that can make quitting easier. Also, check into local programs to help you stop smoking. This is not an easy thing to do. Keep trying, even if you relapse now and then. How can your doctor help? Talk with your doctor about your personal risk factors. Discuss your options. There are a number of smoking cessation aides that your doctor can order (pills, patches, gum, etc.). They can also refer you to programs that are designed to help you to "kick the habit". An important part of managing diabetes is getting regular exercise. Exercise lowers blood sugar levels. If you take insulin or diabetes pills, your blood sugar may drop too low. Knowing how to control blood sugar levels before, during and after exercise is important. Knowing how to adjust food for exercise will help. 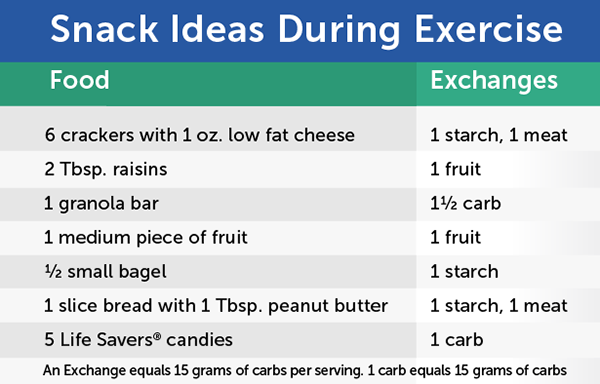 Snack ideas During exercise, you may need some carbohydrates (carbs). If you exercise for more than 1 hour, add a meat serving with the carb. The time that your insulin or diabetes pills work the hardest. Try not to exercise when your insulin or diabetes pills are peaking or working the hardest. Ask your doctor when your insulin or pills peak. Whether or not you have just eaten a meal. Exercise 1-2 hours after eating a meal. This may keep blood sugar from dropping too low. How long and how hard you will exercise. The longer or harder the exercise, the more sugar the muscles will burn. Keep extra carbs with you to avoid low blood sugar. Your blood sugar levels. Check blood sugar prior to the exercise. If your blood sugar is less than 100 mg/dL, eat a snack. This will help keep blood sugar from dropping even lower during exercise. People with type 1 diabetes should not exercise if they show ketones in urine or blood. Are there any special concerns? Low blood sugar may occur for up to 24 hours or even longer, after very intense exercise. To avoid low blood sugar after very hard and long exercise, be sure to adjust your food. Also, check your blood sugar at bedtime. Have a snack if your level is less than 100 mg/dL. Be alert to low blood sugar events for the next 24 - 48 hours. Before starting an exercise program, talk with your doctor. Avoid exercise if you have type 1 diabetes and you have ketones in your urine or blood. Talk with your diabetes educator or doctor about the right times for you to exercise. Always carry fast-acting carbs to treat low blood sugar. Drink water before, during and after exercise. Always stay well hydrated. Check blood sugar before exercise. Check your blood sugar every hour if your exercise session is longer than 60 minutes. Watch for drops in blood sugar after very long and hard exercise. Eat a snack when you finish. Be sure to check your blood sugar before you go to bed. How can your doctor help you? Talk with your doctor about safe exercise for your medical condition. Your doctor may want to adjust your diabetes medicine on days that you exercise. The American Diabetes Association (ADA) states that the guidelines for drinking alcohol are the same for the public AND people with diabetes. The ADA suggests no more than two drinks per day for men and one drink per day for women. * There are some people who should avoid alcohol altogether. They are anyone with a history of alcohol abuse or anyone who is pregnant. People with diabetes who have medical problems, such as pancreatitis, high triglycerides or nerve damage should avoid alcohol. Some medicines may be unsafe when used with alcohol. Ask your pharmacist or doctor. What are the safety measures? Drinking alcohol can affect blood sugar. Drink alcohol only if your diabetes is in good control. For those who take insulin or diabetes pills, low blood sugar can occur. Alcohol prevents the liver from making sugar. It remains in the body up to 8 - 12 hours. During this time, no sugar is released from the liver. The only sugar in the blood comes from food. Therefore, always eat food with alcohol to prevent low blood sugar. Plan to drink with a meal or snack. Mixing alcohol with exercise may cause even lower blood sugars. Are there other things to consider? Too much alcohol can impair judgement. You could forget to check your blood sugar or take your medicines. You might overeat. This could increase blood sugar levels and cause weight gain. Alcohol does contain calories. If you need to lose weight, these calories need to be worked into your meal plan. How does alcohol count? If you take insulin and do not need to lose weight, you can have one or two drinks in addition to your meal plan. Do not omit food. This may result in low blood sugar. If you use regular soda or orange juice as a mixer, the carbohydrates (carbs) should be counted into your meal plan. If you mix alcohol with a non-caloric beverage such as diet soda, it does not need to be counted. If you need to lose weight, alcohol must be counted into your meal plan. Drink alcohol only if your diabetes is under good control and only have one or two drinks per day. Always drink alcohol with food and never on an empty stomach! Avoid caloric mixers and if used, count the carbs into your meal plan. Be sure to avoid exercise before, during or after drinking. Carry carbs to treat low blood sugar levels and in case of an emergency, carry your diabetes I.D. with you at all times. How can your doctor help you? Discuss using alcohol with your doctor. Your doctor will help you decide if it is safe to drink. Knowing how to plan meals is an important part of managing all types of diabetes. Eating meals and snacks at the same time every day helps control blood sugar levels. Sometimes, it is not always possible to do this. Schedules change, special occasions arise or travel plans may make it necessary to change meal times. By using the tips below, you can control your diabetes even when meal times vary. What if your dinner will be later than usual? Usually, you can eat a meal 1 hour before or after your normal mealtime without any effect on your blood sugar levels. If your dinner will be two or more hours later, eat your evening snack close to your usual dinner time. Then, eat your dinner at your usual snack time. This will help avoid low blood sugars at dinner. It will also keep you from getting too hungry. What to do at a brunch? For brunch, it is still best to eat a small "snack-type" meal (fruit and a slice of toast with margarine) at your normal breakfast time. This small meal will keep you from eating too much at the brunch. If you do take insulin or diabetes pills, take your dosage at the normal time. Your doctor can advise you in this matter. After the brunch, eat your afternoon snack at its normal time. What can you do about holidays? Often, the holiday meal is served at noon. Eat your normal breakfast. Have the bigger meal for lunch and a lighter "lunch-sized" meal (sandwich and fruit) for dinner. If you have a bigger lunch, an afternoon snack may not be needed. If the holiday meal is in the middle of the afternoon, eat your breakfast at the normal time. Also, have a late morning snack. An evening snack may or may not be needed. What happens when you have delays at restaurants? If you take insulin or other diabetes pills and your restaurant meal is delayed for one hour or more, eat a small portion of carbohydrate (about 15 grams or 1 slice of bread, 6 crackers or 4 oz. of juice) while you are waiting. This will prevent your blood sugar from dropping too low. What happens when there are delays while traveling? No matter how well you plan your trip, delays can happen. The wise traveler always keeps healthy foods within easy reach. These snacks can be used when travel is delayed or when driving or flying for long periods. Adjust meals and snacks so you get a normal amount of food throughout the day. Plan ahead. If you know a meal is going to be late, take a snack with you. This will help keep you from getting too hungry. Be sure to check your blood sugar levels closely when your normal meal times are changed. Always return to your normal meal pattern as soon as you can. How can your doctor help you? If you do not have a meal plan or do not know how to adjust meals for special occasions, your doctor, dietitian or diabetes educator will be able to help. Your doctor can also explain how insulin and any other diabetes pills might affect your need to eat at certain times of the day to avoid low blood sugar levels. Staying out of the hospital or ER has many benefits! It may help avoid unwanted breaks in your daily routine. It may help keep insurance costs down. You may save money by avoiding co-payments. You may cut down on unpaid days off from work. Try to keep your blood sugar in range. Report highs and lows to your doctor. Talk with your health care team regularly. Keep scheduled follow-up visits with your health care team. Call your doctor or diabetes educator about any problems that occur between visits. When you go to the hospital or ER, let your doctor know. Work with your team to develop a plan you can manage. Every patient should work with a diabetes educator and dietitian. This will help you to learn about your medicine, diet, exercise and lifestyle changes. If you have type 1 diabetes, know how to check for Diabetic Ketoacidosis (DKA). If you are sick, follow sick day guidelines. For people with type 2 diabetes, learn about Hyperosmolar Hyperglycemic Non-Ketotic Syndrome (HHNKS). Repeated episodes of DKA indicate a serious problem. This problem must be corrected. Otherwise, you are at risk for long term problems. Ask you doctor what causes low blood sugar. You also need to know how to avoid having low blood sugar. Changes may need to be made to your medicine, meal and exercise plan. You also need to know how alcohol aff ects your blood sugar. If you have type 1 diabetes, learn how exercise affects blood sugar. Discuss with your doctor how to adjust insulin and food for exercise. Learn how to treat low blood sugar. If you have type 1 diabetes, have glucagon on hand. Teach family, friends and co-workers how and when to give glucagon. How can your doctor help you? These suggestions may help you control your diabetes. In doing so, you may avoid hospital visits. However, if you are very sick you should not wait to seek care. Diabetes is a chronic disease that affects the body and the mind. People diagnosed with diabetes need to learn how to manage their disease. This can be very challenging. It helps to not feel alone or without resources. Being honest about feelings and needs is important. How can you get started dealing with barriers? Education is essential. Challenge yourself to learn more. Never stop learning about diabetes. Research continues to give us new ways to manage and treat diabetes. Try to learn a little at a time. This way you will not feel overwhelmed. You will need to know all about diabetes. How blood sugar affects your body. How to keep your blood sugar in range. What support systems are available. A healthy attitude is needed. It is easy to feel stressed, alone, angry and frustrated. It is important to accept these feelings. Then you need to learn how to work through them. Your doctor and family members may be able to help. Be realistic in your expectations of yourself and your doctor. You will have high and low blood sugar levels. You may do things correctly yet get poor results. Do not dwell on these times; rather turn them into learning experiences. Pick up without guilt or blame. Develop a plan of care and follow the plan. Know when to contact your doctor or diabetes educator. You will need to do this when changes in your plan are needed. Manage stress. Ask for help in managing stress. Seek out others in local support groups and classes who have worked through their barriers. Become self-reliant by caring for your diabetes and yourself. Learn about meal planning, exercise, medicines and checking you blood sugar. How can your doctor or diabetes educator help? Your doctor and your diabetes educator are your best resource for information and guidance. They can help you stay healthy. Consult your doctor and diabetes educator if you detect problems that interfere with your health goals. When a person chooses to drink alcohol, they should learn some helpful tips to control their blood sugar levels and prevent alcohol abuse. Every person needs to pay special attention to how much they drink, when they drink and why they drink alcohol. Getting started By using these simple tips, you will learn how to be more in control of your drinking. You will also learn how to avoid any problems connected with drinking alcohol. Plan how much you will drink before you go out. Look for problems that could arise and try to avoid them. If you are pressured because you do not drink, do not be afraid to make your feelings known. Remember parties are for having fun, not for drinking alcohol. Do not use alcohol to avoid stress. Do not get into the habit of drinking every time you go out. Do not get into the habit of drinking at a certain time of the day. If you choose to drink, do not drink on an empty stomach. Eat some food with your drink. This will decrease the risk of low blood sugars. It is best to avoid drinks with sweet liqueurs, cordials and most frozen drinks. These drinks contain high amounts of sugar. Slow down! Limit your drinks to 1-2 per day. Sip your drink. Do not quench your thirst with alcoholic drinks. Try water, seltzer or sugar-free soda. Have 1 alcoholic drink. Then with your next drink, skip the alcohol. After that, have your second alcoholic drink. Remember to limit your alcoholic drinks to no more than 1-2 per day. If you are taking medicines of any kind, discuss whether you should be drinking alcohol with your doctor. Check with your dietitian to see how alcohol fits into your meal plan. Go to places where alcohol is not served. Never drink and drive. Never ride with a person who has been drinking too much. Avoid alcohol if you are pregnant. Always carry an I.D. about your diabetes in your purse or wallet. How can your doctor help you? If you think you have an alcohol problem, get help. Ask your doctor to refer you to an alcohol treatment program. You can look in your local phone book for support groups such as Alcoholics Anonymous. Do not wait until the problem is out of control. Remember, an entire family suffers when one member of the family has a drinking problem. The less you drink, the better you feel. Drink in moderation. It can be done. Talk with your doctor about finding a behavioral health specialist. For years, doctors believed that controlling blood sugar levels would decrease the risk of diabetes problems. However, it was not until the 1990's that they got proof. Two studies were done. The first one was called The Diabetes Control and Complications Trial (DCCT)*. The second was the United Kingdom Prospective Diabetes Study (UKPDS). Both studies showed that lowering blood sugar did decrease the risk of diabetes problems. The Diabetes Control and Complications Trial In 1993, the results of the DCCT were made available. This study involved people that had type 1 diabetes. There were two different groups. One group received "standard treatment." The goal for this group was clinical well-being. The second group received "intensive treatment." The goal of this group was to keep blood sugar levels in normal range. During the study, the intensive group was not able to achieve normal blood sugar levels. The average blood sugar was 155 mg/dL. The average A1c was 7.2%. In spite of this, the results were dramatic. The intensive group had: A 60% decrease in small blood vessel problems; Eye disease decreased by 76%; Kidney disease decreased by 35-56%; Nerve disease decreased 60%. By lowering blood sugar levels, the study showed a delay in the onset of the above problems. The study also showed when blood sugar levels were in range it slowed further progression of problems. The standard group did not achieve the above goals. The Kumamoto Study and the United Kingdom Prospective Diabetes Study (UKPDS) Doctors believed that lowering blood sugar in people with type 2 diabetes would have the same results as the DCCT. They did not have the proof until the results were published in 1998. It compared treatment with diet and pills to standard treatment of diet alone. Another aspect of the study looked at "tight" versus "less tight" control of high blood pressure.This helped determine the benefits of lowering blood pressure. From an average starting A1c of 9.1%, the intensive group was able to reach an average A1c of 7.0%. The standard group reached an A1c of 7.9%. Blood vessel problems were decreased by 25% in the intensive group. The intensive group also had a 16% decrease in the risk for heart attack and sudden death from heart disease. Lowering blood pressure lowered the risk of stroke, diabetes related deaths, heart failure, vision loss and small blood vessel problems. The UKPDS study showed that by lowering blood sugar levels patients decreased their risk of diabetes problems. How can you become well-focused? Work with your doctor to set blood sugar goals. Practice self-management of your diabetes. Work with your team to control blood pressure. Use diet, medicines and exercise to meet these goals. Your doctor can help by working with you to set blood sugar goals and referring you to a diabetes educator and a dietitian to help you meet your goals. Your doctor can also help you find local resources to address other risk factors. Damage to the large blood vessels is known as Cardiovascular Disease (CVD). It can occur in people who do not have diabetes. It is much more frequent and happens at an earlier age in people with diabetes. Large blood vessels carry blood to and from the heart and all other parts of the body. They become damaged when fats (cholesterol and triglycerides) are deposited along their inner walls. The blood vessels then become stiff, narrow and less flexible. The damaged blood vessels do not get enough blood to the heart, resulting in a heart attack. When this happens in the blood vessels of the brain, it can lead to a stroke. If this occurs in the large vessels of the legs and feet, it can lead to pain in the calves, ulcers and slow-healing wounds. Keep blood sugar levels well controlled. Some problems may be delayed or prevented with improved blood sugar control. Stop smoking. If you smoke, the single, most important preventive step is to stop. Get regular exercise. Be sure to check with your doctor before starting an exercise program. Lose weight if needed. Being overweight increases your risk of heart disease. Control high blood pressure. Reduce salt intake if needed. Lose weight and exercise. If needed, your doctor may order medicine to lower your blood pressure. Treat blood fat disorders. Follow a low fat diet. Lose weight if needed. Get regular exercise and control blood sugars. Your doctor may prescribe medicine to lower your blood fat levels. Check with your doctor about taking an aspirin every day. An electrocardiogram (EKG) to check your heart. An A1c to check on your diabetes control. A stress test to check your heart. Below is a list of tests used to check the health of the mother or baby during pregnancy. Ask your doctor if you have any questions about any of these tests. Fetal ultrasonography or ultrasound - done in the first three or four months of pregnancy (can be done as early as 8 weeks). This test is done to see how far along the pregnancy is. It also checks to see how the baby is developing. Serial ultrasounds or ultrasounds - done on a regular basis. It checks the baby's growth and the placenta. It measures the amount of amniotic fluid. Fetal echocardiogram - a test done between 20 to 22 weeks. It screens for fetal heart problems. It is done because heart problems are more common in babies of women with preexisting diabetes. This test can also be done at 32 to 33 weeks. Maternal serum alpha-fetoproteins (MSAFP) - a test to see if the baby is at risk for a neural tube defect. It is done at 15 to 18 weeks. This test is offered to all pregnant women. Fetal kick counting - an easy way to tell how the baby is doing. Fetal kick counts usually begin at 26 weeks. The mother counts how many times the baby moves in a certain period of time. The nonstress test (NST) - another way to check the baby's overall health. Two disc-shaped sensors are placed on the mother's stomach. One records the baby's heart rate. The other detects uterine contractions. This is often done at about 32 to 34 weeks. It may be done earlier and more often as needed. The contraction stress test (CST) - measures the baby's heart rate in response to mild uterine contractions. This test is used to assess the baby's well being. It is done after 32 to 34 weeks. A biophysical profile (BPP) - an ultrasound test and a check of the fetal heart. It measures the baby's breathing movements, body movement, muscle tone, amniotic fluid volume and heart rate. It is done after 28 weeks of pregnancy. Amniocentesis - involves taking a sample of the amniotic fluid from around the baby. Often done before labor is induced. This test makes sure the baby's lungs are mature. How can your doctor help you? Your doctor can explain why certain tests are needed. He/she can tell you how they are done and what to expect. He/she will explain the results. Your doctor may refer you to a perinatologist. This doctor treats high-risk pregnancies.